Salary Slip Andhra Pradesh and Telangana AP/TS Treasury Pay Slip Download via Employee ID. AP Telangana Employees Pay Details,Know Your Online Salary Particulars and Download Pay Slips AP Telangana #EmployeePayDetails/ #KnowYourSalary Particulars/ Download #OnlinePaySlips: Know your #EmployeeSalaryDetails with out pass word and not required your mandal DDO Code. Only you should have STO Treasury ID it is already we known as Employee Id. Andhra Pradesh Treasury Department Official Site: https://treasury.ap.gov.in Telangana Treasury department Official Site: https://treasury.telangana.gov.in/. Andhra Pradesh State Employee can Download Your Salary Particulars from here by entering your employee id. 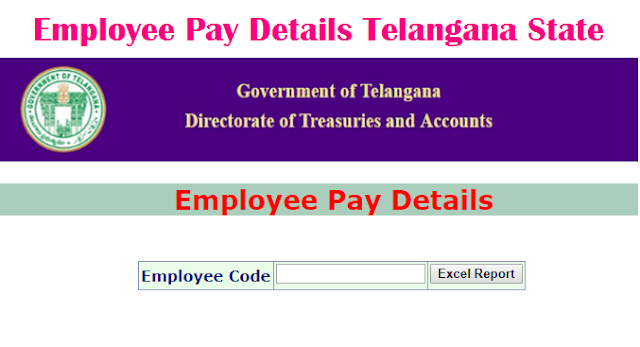 Telangana State Employee can Download Your Salary Particulars from here by entering your employee id. After the partition of Andhra Pradesh and Telangana the treasury department is distributed also in two parts. For both the official website has been made by the IT department in for Andhra Pradesh https://treasury.ap.gov.in and for Telangana in https://treasury.telangana.gov.in/. Through the both of websites the treasury department has the responsibility to provide the salary slip online for the employees working under the state government administration. The employees serving for the Andhra Pradesh state government or Telangana state government can download their pay slip online through using the official website of treasury dept and can get the time to time statement for their pay roll account. Through visiting in the treasury official portals you can check the salary details without the password authentication or without using the DDO code of mandal. To check the pay slip you just need the STO treasury code or id, which is provided you through the treasury office. The employees working under the Andhra Pradesh can download their salary statement on the official website. Know Your Online Salary Particulars: Employee Pay Details System is an online web portal. It is to provides monthly wise salary details or particulars of Employee of the Government of Andhra Pradesh and Telangana State. AP Treasury Officials maintains this AP Employee Pay Details System and Telangana State Cyber Treasury maintains the T State Employee Pay Details System. These two online web portals are very useful to both states of Govt. employees. AP Telangana Employees no need to go office to know their salary particulars and they no need to consult higher officials or bills in-charge person. If you want to know your monthly salary particulars? No need to Know your mandal DDO Code and Pass Word. Just you should have only your Employee Id, this is a Treasury Employee Code. It is provided by the Treasury Officials. Now Just type your Treasury Employee Code and then Use TAB Key only. Then your salary particulars will be appear on online webpage. First go to the official website of treasury department of Andhra Pradesh where in the home page you can get the option of salary slip. You also can visit to the below given link direct to download your pay slip now. After visiting in the website you just have to enter your employee id / employee code as per given by the treasury department. If you are not having yet this employee ID number go to nearest treasury office and take help through the departmental person to obtain the id. In this online official website with just using the employee id number of treasury you can get the complete details. After filling the employee id click to the button of Excel Report after which you can download the complete report. This report of salary will convert into the excel sheet which you can download in the A4 size paper. The employees can download the salary details of their previous complete year (12 months) anytime whenever they want. Through using these particulars of pay the employees can calculate their income tax while submitting the ITR. If you want to download salary particulars, now click on Excel Report button, you can get download past 12 months of your complete salary details. These particulars are useful to for your Income Tax Calculation and Salary Certificate Preparation. After visiting in the website you just have to enter your employee id / employee code as per given by the treasury department Then you will get salary certificate. Any of the employees working under any of the department or administration under the Andhra Pradesh or Telangana state government can download his complete details. If you want to get the contact details of treasury office visit to the below given links where you can get the complete details and contact phone numbers of departmental person. As per the new treasury software designed & developed by Treasuries & Accounts Andhra Pradesh AP Technology Services Ltd, Institute for Electronics and Governance under the state government the employees can get their pay details on the monthly bases. The employees can download their salary particulars for which they don’t require the DDO code or any password of their account. The treasury department of AP and TS have the responsibility to maintain all the data and information related to the salaries of employees working for the state government. Through starting this service online the government has the main object to provide the salary slips with using net facility so that the employees can save their time and money both and they don’t need to go in the treasury offices again and again for obtaining their pay slip. Telangana Treasury Official Site: https://treasury.telangana.gov.in/.